The winner and honor books for the 2019 Massachusetts Children’s Book Award were announced this month. While our readers at DCD didn’t choose the state winner, they voted for three of the books that are the 2019 honor books. Jennifer Nielsen’s book, A Night Divided, was this year’s winner. Her thank you letter discusses her novel and her inspiration for it. “The book’s origin came from Ilona, a friend of our family’s. She was born into East Germany and at age five, her family made the decision to escape. Ilona’s parents planned to escape through the countryside. However, they didn’t want to take a five-year-old running through the countryside, so a different plan had to be put in place for Ilona. Her grandparents in the west would come over by train, and then return by train with Ilona – not on the seat beside them because she had no papers. Instead, Ilona was drugged, put to sleep, and hidden in the baggage car of the train beneath a pile of hay. The knew the car would be searched at the border, and if Ilona even rolled over in her sleep, she would be sent back to East Germany alone and her grandparents would be arrested, or worse. To read the rest of Nielsen’s acceptance letter go to the MACBA site here. The honor books are Ghost by Jason Reynolds, A Handful of Stars by Cynthia Lord, Rain Reign by Ann M. Martin, and Framed by James Ponti. This week, we celebrated reading with our annual Massachusetts Children’s Book Award voting party. Prior to choosing their top books, the participating students advocated for their personal preferences. Many of the children commented that they were introduced to new authors and series that have now become favorites. The winner of the vote is Rain Reign by Ann Martin. Rose is thrilled that her name is a homonym (rows). She names her dog Rain because that also has homonyms (reign and rein). Rose’s autism is evident through the rules that she makes for herself. It is difficult for her father and her teachers to understand her. When Rain disappears in a flood, Rose must break her own rules and overcome her fears to search for him. There were three books that came in very close in the voting. Ghost by Jason Reynolds is about a track team from an elite middle school where the main character is not only running on the field but also running from his problems. Framed by James Ponti is an entertaining mystery about middle schooler who has a knack for solving mysteries, even one that puzzles the FBI at the National Gallery. Towers Falling by Jewell Parker Rhodes tells the story of three friends from very different cultures whose families are all affected by the event of 9/11 that happened before Déja, Ben, and Sabeen were born. The winner and honor books for the 2018 Massachusetts Children’s Book Award were announced this month. Our readers at DCD chose the same book as the state winner, and they also voted for two of the state honor books. This year’s most highly rated book is The War That Saved My Life by Kimberly Brubaker Bradley (Dial). The setting is Great Britain during WWII. The protagonist is Ava, a young girl who was born with a club foot. Her mother shows Ava no affection. Ava envies her brother who is able to run free and escape the loveless home. When children are being evacuated from London and welcomed into homes in the safer countryside, she sneaks off to join her brother whom her mother put on the transport. When the siblings are sheltered by a recluse who is forced to house them, Ava finally experiences something that she always longed for, kindness. Yet, she does not know how to accept it. The fourth, fifth, and sixth graders who read this novel all enjoyed this book. They have now moved on to the sequel, The War I Finally Won which was recently published. The two honor books that DCD’s readers chose are Space Case by Stuart Gibbs (Simon & Schuster) and Fish in a Tree by Lynda Mullaly Hunt (Nancy Paulsen Books). There were a number of quality selections that were nominated for the award this year. Our readers were introduced to some authors and genres that were new to them. We look forward to Salem State University’s publication of the list of nominees for 2019. Those will be announced soon. If the name Ken Jennings sounds familiar to you, then you might be a fan of the television show, Jeopardy. Jennings holds the record for the longest winning streak on Jeopardy with 74 straight wins. Today’s intermediate readers know him for one of this year’s Massachusetts Children’s Book Award nominated books, Ken Jennings’ Junior Genius Guides: Maps and Geography, illustrated by Mike Lowery (Little Simon). It’s interesting to ask the students if they like this book because it’s difficult for some to read non-fiction, especially non-fiction that appears to be about disparate topics. Others enjoy the randomness of the facts that they learn from Jennings. Lowery’s illustrations that accompany the topics are similar to those of Jeff Kinney’s in his “Wimpy Kid” books. Another non-fiction nominee this year is Coral Reefs: Cities of the Ocean (First Second) by Maris Wicks. The author/illustrator uses a graphic format to describe many of the fish and creatures that can be found in a coral reef. 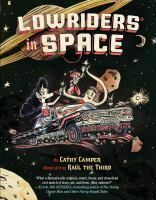 There are two graphic novels that are nominated for this year’s Massachusetts Children’s Book Awards: Lowriders in Space by Cathy Camper, illustrated by Raúl the Third (Chronicle) and Roller Girl by Victoria Jamieson (Dial). When I was a child, I never paid attention to author’s notes in books. Now, I try to impress on young readers that there is often a treasury of background information that will often add to their enjoyment. 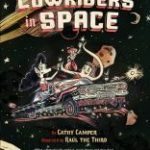 There is “A Note About Lowriders” in the back of Camper’s graphic novel that should really be at the beginning of Lowriders in Space. A lowrider is a customized car with hydraulic jacks that allow the chassis to be lowered nearly to the road. This custom was created by Mexican-Americans in Southern California after WWII. The author took this idea and created a fantasy about a car that travels out of this world. Roller Girl is entertaining with a message about growing up. Astrid is a twelve-year-old girl with a best friend, Nicole. The summer before middle school, Astrid signs up for roller derby camp while Nicole goes to ballet camp. It’s a difficult time for Astrid as she struggles to learn to skate, and she watches her friend slip away from her. Even so, she grows and learns about herself as she becomes a secret pen pal with the adult roller derby star. The author, Victoria Jamieson, was a professional roller derby skater herself. to turn an enemy into a friend. –Dr. Martin Luther King Jr. When books are selected for the Massachusetts Children’s Book Award Program, the selection committee carefully considers genre, the quality of the writing, and the inclusion of a variety of cultural groups. As I look at the list every year and introduce them to children, I discuss each book’s uniqueness. I also point out similarities in style or theme. Two of this year’s nominated books are written in verse, but that isn’t the important similarity. The protagonists in the books must learn to navigate in a society that often discriminates against them. They work to turn prejudice into acceptance. Full Cicada Moon by Marilyn Hilton (Penguin) is a novel written in first person. The narrator, a young girl, has moved with her family to Vermont. Her heritage is half-black and half-Japanese, and in 1969, Vermont was mostly white. Mimi Yoshiko Oliver finds out that to answer her classmates’ and adults’ questions about “what she is”, she needs to figure out “who she is”. Mimi defies stereotypes, and she also wants to be an astronaut, an opportunity that wasn’t open to women at that time. brown girl dreaming by Jacqueline Woodson (Penguin) is also written in first person, and it is an autobiography. This book has already received numerous awards, among them was a commendation as a Newbery Honor Book. Woodson writes about living in South Carolina and Brooklyn, New York. Her family were Jehovah’s Witnesses, and she experienced racial and religious discrimination. For me, one of her most poignant selections is “because we’re witnesses”. We will never go to war. We will never taste the bitterness of a battle. Once again, we will be promoting the nominees for the Massachusetts Children’s Book Awards (MCBA) during the 2017-2018 school year at DCD. Even though I’ve written about this program before, I would like to explain it to parents who have never had a fourth, fifth, or sixth grader who is participating. This voluntary reading incentive program has become a popular event for many students. Started by Dr. Helen Constant in 1975, it is administered through Salem State University. Twenty-five books are nominated for the award, and our voting for the DCD favorites will take place in late winter. There are many obvious benefits to reading along with us for the next few months. Students are often introduced to authors who are unknown to them before this, and they return looking for other books by them. Some of the authors, like Liesel Shurtliff and Tom Angleberger, are already favorites of many intermediate readers. An important benefit that may not be obvious is that our readers become critics. They learn how to evaluate literature through plot, characters, and interest, and they have fun doing so. Throughout the next few months, I’ll highlight some of the nominated titles. Links to the reading lists and our required journal pages can be found on our DCD Library page. From time to time, I’ll be reviewing some of the titles under consideration for the award. So…let me write about one today. The Massachusetts Children’s Book Award (MCBA) 2017 winner and honor books were announced recently. It’s always interesting to compare the state-wide choices to those made by our DCD readers. Often, our DCD choices come pretty close to those from all over Massachusetts. This year, we had chosen two of the four top books. El Deafo is autobiographical, and it is written in graphic form. Don’t let the art fool you into dismissing the book as easy. Cece Bell handles the topic of being hearing impaired with sensitivity and humor. When those involved in nominating books for the Massachusetts Children’s Book Award (MCBA) at Salem State University choose titles, they look for representatives of different genres. There are selections that represent non-fiction, historical fiction, fantasy, and contemporary fiction. Recently, there have also been graphic novels as nominees. It’s important to understand that a “graphic novel” is not a genre, it is a format. A graphic uses art that is similar to comic books, with sequential panels and dialogue telling the story. Graphics are conceived in every genre: fiction, non-fiction, history, science fiction, or fantasy. Two nominees for the 2017 MCBA are in graphic form. El Deafo by Cece Bell (Abrams) is a memoir. In this 2015 Newbery Honor Book, Bell uses humor to tell her unique story of growing up as a hearing impaired child. She was equipped with a bulky hearing aid that included a box like piece strapped to her chest. This made it difficult to make friends, so Bell imagined herself as a superhero. Our other selection is The Stratford Zoo Midnight Revue Presents: Romeo and Juliet by author Ian Lendler and cartoonist Zack Giallongo (Roaring Brook Press). When the zoo closes at night, the animals come out of their cages. They are all actors, and they stage one of the world’s classic plays. Once again, we will be promoting the nominees for the Massachusetts Children’s Book Awards (MCBA) during the 2015-2016 school year at DCD. Even though I’ve written about this program before, I would like to explain it to parents who have never had a fourth, fifth, or sixth grader before now. This voluntary reading incentive program has become a popular event for many students. Started by Dr. Helen Constant in 1975, it is administered through Salem State University. Twenty-five books are nominated for the award, and our voting for the DCD favorites will take place in late winter. There are many obvious benefits to reading along with us for the next few months. Students are often introduced to authors who are unknown to them before this, and they return looking for other books by them. Some of the authors, like Jennifer Holm and Lauren Tarshis, are already favorites of many intermediate readers. An important benefit that may not be obvious is that our readers become critics. They learn how to evaluate literature through plot, characters, and interest, and they have fun doing so. Throughout the next few months, I’ll highlight some of the nominated titles. Links to the reading lists and our required journal pages can be found on our DCD Library page. From time to time, I’ll be reviewing some of the titles under consideration for the award. So…let me write about two today. Both of the books fall into the same genre, which I term realistic fantasy or magic realism. The (often) contemporary characters live in a world or society that we recognize, but magic happens. When this is portrayed to a reader by a talented author, one accepts this different reality and enjoys the story. Bliss, by Kathryn Littlewood (HarperCollins), introduces a delightful family who own a bakery that is beloved in their town. The protagonist, Rose, suspects that her parents employ magic when baking some of their special foods. When her parents go out of town, Rose and her siblings are supposed to protect the family’s Cookery Booke, that is kept under lock and key. They are surprised when a flashy and an unknown aunt rides into town on her motorcycle. Rose is drawn in by her new-found aunt, and she begins playing with powerful magic. This is the first book in the Bliss Bakery Trilogy. The other books are A Dash of Magic and Bite-Sized Magic. Jennifer Holm’s book, The Fourteenth Goldfish (Random House for Young Readers), is a humorous book that tackles the subject of immortality. Humor and immortality? Yes, the main character, Ellie, is a sixth grader who is struggling to navigate middle school. She misses her best friend, and she learns that her mother had been replacing her goldfish every time it died without her knowledge. When a new, weird boy approaches her, he reminds Ellie a lot of her grandfather who is a scientist obsessed with immortality. Many readers may know Holm from her graphic novels featuring Babymouse.